Plussaw is an addictive puzzler by Definitely June. Try to complete each goal by adding up the numbers in the different colored squares without going over to move onto the next level. After, brag about your score using the iPhone app’s option to publish it on facebook or twitter. Each square has a number, 1-4 assigned to it. To select the squares, run your finger over them. After you lift your finger from the screen without fulfilling the total assigned to you, all of your squares are deselected. The squares are a little small, even for my fingers, so you may get a little frustrated as you run your finger down the board because you won’t be able to see the numbers so well. However, you can use more than one finger at the same time on different parts of the board. 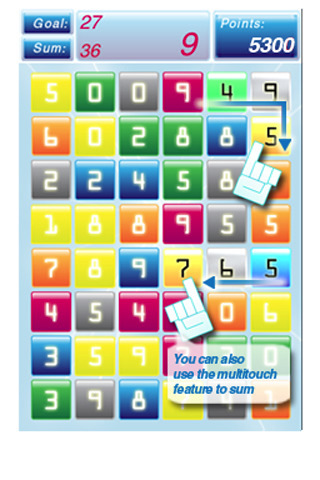 In the first stage you need to use up all of the squares on the board, adding them up to the amount of 16. The score bar at the top of the screen shows your progress: how much time you have remaining, what your score is, and how many more squares you need to use. Each square is marked after you use it, letting you know which ones you still need to use. However, you can still use the same square multiple times if you need the appropriate number. As your tasks get more difficult, you may want to take advantage of the option of tapping a square, each time to increase the number of it. For example, on one level you need to select a set number of each color of squares, while at the same time making the totals of each group of selected squares add up to 23. If you need another yellow square, but the only one available is at a value of 4 and you already have a total of 20, tap the yellow square until it has the value of 3 and you’re good to go. The level of difficulty for Plussaw gradually increases, which I really like; I’m not a fan of the iPhone app games that become impossible after the first round. You don’t need to be a big fan of math either; as long as you know your addition you’ll enjoy this game. I hope the developers do something about how you select the numbers though. As I mentioned earlier, it’s difficult to see the board when your fingers are all over it. It would be nice if each square that my finger is on enlarges as I select the squares (kind of like the iPhone keyboard when texting, how letters get bigger when you touch one). AppSafari review of Plussaw was written by Amanda McFarland on July 1st, 2010 and categorized under App Store, Games, Puzzler. Page viewed 4113 times, 1 so far today. Need help on using these apps? Please read the Help Page.